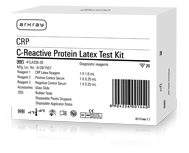 RA/ASO/CRP Latex | ARKRAY, Inc. Rapid and Simple test procedure. Polystyrene latex particles of optimized size are used. All the components & accessories required to perform test are included in the kit.